[131 Pages Report] elastomeric sealants market was valued at USD 3.55 Billion in 2016 and is projected to reach USD 5.19 Billion by 2022, at a CAGR of 6.6% during the forecast period from 2017 to 2022. The elastomeric sealants market has been segmented based on type, end-use industry, and region. Based on type, the elastomeric sealants market has been segmented into Polyurethane (PU), Polybutadiene (PB), Polysulfide (PS), silicone, acrylic, Silyl Modified Polymer (SMP), and others. Based on end-use industry, the elastomeric sealants market has been segmented into construction, automotive & transportation, electronics, furniture & woodworks, aerospace & defense, marine, and others. Based on region, the elastomeric sealants market has been segmented into Asia Pacific, North America, Europe, South America, and the Middle East & Africa. The base year that has been considered for the study is 2016 and the forecast period considered is between 2017 and 2022. Both, top-down and bottom-up approaches have been used to estimate and validate the size of the elastomeric sealants market and estimate the sizes of various other dependent submarkets. The research study that has been used, involved extensive use of secondary sources, directories, and databases such as Hoovers, Bloomberg, Factiva, the Securities and Exchange Commission (SEC), the Association of the European Adhesive & Sealant Industry (FEICA), and the American National Standards Institute (ANSI) to identify and collect information useful for this technical, market-oriented, and commercial study of the elastomeric sealants market. This study answers several questions for various market players across the value chain of products, primarily which market segments to focus on, in the next two to five years for prioritizing their efforts and investments. Key players operating in the elastomeric sealants market include The Dow Chemical Company (US), Henkel AG (Germany), 3M Company (US), Arkema (France), and Sika AG (Switzerland), among others. This research report categorizes the elastomeric sealants market based on type, end-use industry, and region. 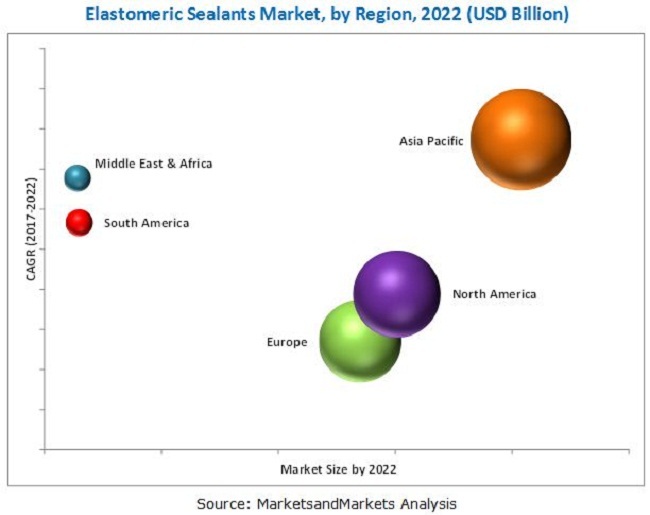 The elastomeric sealants market has been further analyzed based on key countries of each of these regions. The elastomeric sealants market is projected to grow from USD 3.77 Billion in 2017 to USD 5.19 Billion by 2022, at a CAGR of 6.6% during the forecast period from 2017 to 2022. The growth of the elastomeric sealants market can be attributed to the increasing applications of elastomeric sealants in the construction industry and rising demand for automobiles and electronics products across the globe. Elastomeric sealants are increasingly used in the automotive & transportation industry due to their high durability, good adhesion, excellent flexibility, and high heat resistance. Moreover, development of lightweight electric vehicles is also driving the growth of the elastomeric sealants market across the globe. Increased consumption of elastomeric sealants in developed economies such as the US and Germany and emerging economies such as China, India, and Brazil is also leading to the growth of the elastomeric sealants market across the globe. The elastomeric sealants market has been segmented based on type into Polybutadiene (PB), Polysulfide (PS), Polybutadiene (PB), silicone, acrylic, Silyl Modified Polymer (SMP), and others. The silicone type segment accounted for the largest share of the elastomeric sealants market in 2017, in terms of volume. The Silyl Modified Polymer (SMP) type segment of the elastomeric sealants market is projected to grow at the highest CAGR in terms of both, value and volume during the forecast period. The growth of the Silyl Modified Polymer (SMP) type segment of the elastomeric sealants market can be attributed to the increased demand for silyl modified polymer elastomeric sealants from the automotive & transportation and marine industries. Based on end-use industry, the elastomeric sealants market has been segmented into construction, automotive & transportation, electronics, furniture & woodworks, aerospace & defense, marine, and others. The construction end-use industry segment accounted for the largest share of the elastomeric sealants market in terms of volume in 2017. This segment of the market is projected to grow at the highest CAGR during the forecast period, in terms of both, value as well as volume. The rising demand for residential and commercial infrastructures is driving the growth of the elastomeric sealants market across the globe. The elastomeric sealants market has been studied in Asia Pacific, North America, Europe, South America, and the Middle East & Africa. The Asia Pacific region is expected to lead the elastomeric sealants market during the forecast period. The growth of the Asia Pacific elastomeric sealants market can be attributed to the economic development taking place in different countries of the Asia Pacific region. Moreover, increased investments by private and government sectors in the construction industry of the Asia Pacific region is also fueling the growth of the elastomeric sealants market in the region. The elastomeric sealants markets in China, India, Mexico, and Brazil are also witnessing significant growth, owing to the increased consumption of electronic products and automobiles in these countries. However, growing concerns over emissions of Volatile Organic Compounds (VOCs) act as a restraint to the growth of the elastomeric sealants market across the globe. Key players operating in the elastomeric sealants market include The Dow Chemical Company (US), Henkel AG (Germany), 3M Company (US), Arkema (France), and Sika AG (Switzerland), among others. 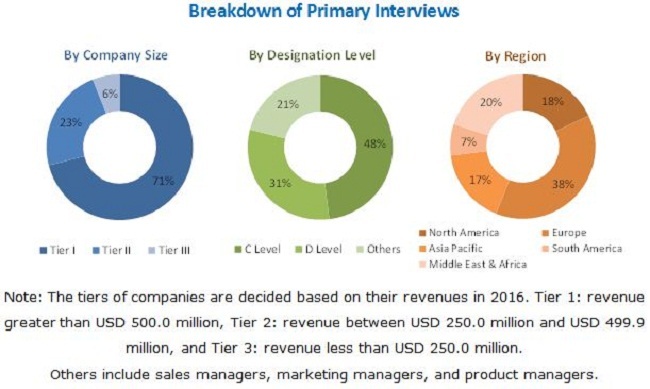 These leading players have adopted various growth strategies such as expansions, new product launches, acquisitions, and mergers to strengthen their position in the elastomeric sealants market and widen their customer base. For instance, in 2017, The Dow Chemical Company (US) merged with DuPont (US) to form DowDuPont (US) to cater to the increased demand for elastomeric sealants from various industries. In 2016, The Dow Chemical Company (US) launched three silicone elastomeric sealants for use in various industries such as construction, automotive & transportation, and electronics, among others. 11.11.2 Draco Construction Chemicals Inc.
11.11.7 Mule-Hide Products Co. Inc.
11.11.11 Saudi Vetonit Co. Ltd.
11.11.15 Vcm Polyurethanes Pvt. Ltd.